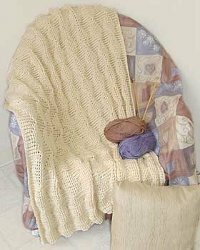 Use this free crochet afghan pattern from Bernat Yarns to create a brilliant pattern. This is an easy pattern you can make your friends too. Worsted weight yarn makes this nice and warm. GAUGE:11 dc and 6 rows = 4 ins [10 cm]. Note: Ch 2 at beg of row counts as st. Ch 127. 1st row: (RS). 1 dc in 4th ch from hook (counts as 2 dc). 1 dc in each ch to end of ch. 125 dc. 2nd row: Ch 2. 1 dcfp in each of next 7 sts. * 1 dcbp in next st. 1 dcfp in each of next 11 sts. Rep from * to last 9 sts. 1 dcbp in next st. 1 dcfp in each of next 8 sts. Turn. 3rd row: Ch 2. 1 dcbp in each of next 6 sts. * 1 dcfp in each of next 3 sts. 1 dcbp in each of next 9 sts. Rep from * to last 10 sts. 1 dcfp in each of next 3 sts. 1 dcbp in each of next 7 sts. Turn. 4th row: Ch 2. 1 dcfp in each of next 5 sts. * 1 dcbp in each of next 5 sts. 1 dcfp in each of next 7 sts. Rep from * to last 11 sts. 1 dcbp in each of next 5 sts. 1 dcfp in each of next 6 sts. Turn. 5th row: Ch 2. 1 dcbp in each of next 4 sts. * 1 dcfp in each of next 7 sts. 1 dcbp in each of next 5 sts. Rep from * to end of row. Turn. 6th row: Ch 2. 1 dcfp in each of next 3 sts. * 1 dcbp in each of next 9 sts. 1 dcfp in each of next 3 sts. Rep from * to last st. 1 dcfp in last st. Turn. 7th row: Ch 2. 1 dcbp in each of next 2 sts. * 1 dcfp in each of next 11 sts. 1 dcbp in next st. Rep from * to last 2 sts. 1 dcbp in each of last 2 sts. Turn. 9th row: As 5th row. 10th row: As 4th row. Rep 2nd to 11th rows 11 times more. Fasten off. With RS of Afghan facing, join yarn with sl st to upper left corner. Rep from ** to ** as given for other side. Now that I have seen the correction the pattern makes sense. The blanket does look like it has a nice texture to it which keeps it from looking ordinary. I am going to attempt it. I can never have too many blankets. I have a storage cube at the bottom of my bed with them. In addition I make blankets for charity and some family would love this one. Thank you for the pattern. Please correct the instructions for "dcfp" or remove this pattern. I appreciate the person whose comment made the correction. Hi there! I've added the reader's helpful comment to this pattern. I hope that helps! -Dana from FaveCrafts. How great that we get the pattern directly above and also the abbreviations, too. That is very helpful. Your back post double crochets will just take a little bit of practice on your part. It's actually rather fun learning how to master a new stitch! What size does this come out to be? I'm close to being finished with this project. The double crochet front post and back post creates a beautiful textured pattern. My color is soft white and will include roses on the border. Great gift for weddings, birthdays, new moms or for yourself. Thank you for the pattern Favecrafts. Please include the number of yards of yarn, not just its weight. Thanks. 1-400g ball of bernat worsted is 867 yards, most people just google it, in less than the amount of time it took you to leave this comment. I canniot get a print of this pattern. I have not had problems like this before. I seem to have trouble with either gaing stitches, or losing stitches. When you turn a piece and chain 2 (or3), do you count the stitch or not count the stitch that is on the crochet needle, when going starting the next row? The pattern should tell you whether to count the turning chain or not. If it doesn't, the standard practice is not to count it for single crochet (1 ch), but to count it for double or triple crochet stitches. You count it as part of the new row. I'm sitting here trying to work this out and I honestly don't see why this should be called "easy". Working 1 row below is not so bad, but 2 rows below, when you've only got one row of dc done is a trick I can't manage! I have done post stitches before and therefore I can tell you that you are having a problem due to a typographical error. Compare dcbp and dcfp. Actually there are 2 errors in the dcfp directions. It should read: "YOH and draw up a loop around post of next st at front of work 1 row below, inserting hook from right to left. (YOH and draw through 2 loops on hook) twice." I hope that helps. i do not get your dcbp and dcfp either they are excatlly the same as a ds and triple stitch what is the difference? The dcbp means double crochet through the back post and dcfp means double crochet through the front post. I believe the difference is that you are going around a post as opposed to in a stitch. I hope this helps. Under abbreviations, I do not understand the instructions for dcbp and dcfp. 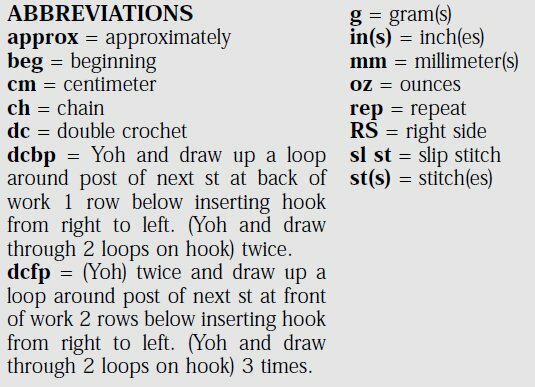 Also at the beginning of instructions it says 'Note: Ch 2 at beg of row counts as st.' do you mean as in a turning chain? I am a newbie and trying to get used to "each person's" lingo...it means the same but is stated differently than other instructions so is confusing. Thanks for the help! The note is shown as #1; the actual row 1 is #2, etc. Don't confuse the row number with the step number. Step 1 is making the chain. Step 2 is row 1. Get it? I would not have used step numbers, confusing.